Astronomers have detected the oldest known Earth-size planets, in a star system that's 11.2 billion years old. They say the discovery suggests that life could have existed throughout most of the universe's 13.8 billion-year history. 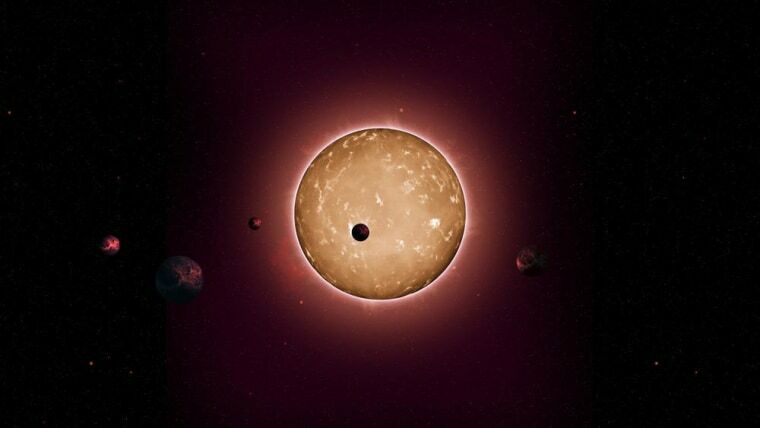 The five Earth-size planets were detected through an analysis of data from NASA's Kepler space telescope, which looks for telltale variations in starlight as planets cross a star's disk. In this case, the star lies 117 light-years from Earth and is 25 percent smaller than our sun. It's known as Kepler-444. The researchers used a technique called asteroseismology, which measures tiny oscillations in a star's brightness, to determine Kepler-444's extreme age. The planets range in size between Mercury and Venus, but they all circle Kepler-444 within the orbit of Mercury in our own solar system. That would make them too hot to be habitable by life as we know it. Nevertheless, the fact that such planets could form so early in the universe's history suggests that life-friendly worlds could exist for billions of years. "There are far-reaching implications for this discovery," Tiago Campante of the University of Birmingham, the lead author of a paper published Tuesday by The Astrophysical Journal, said in a news release. "By the time the Earth formed, the planets in this system were already older than our planet is today. This discovery may now help to pinpoint the beginning of what we might call the 'era of planet formation,'" Campante said. What's Next in the Hunt for Alien Planets? @bdorminey re:Kepler-444, if ancient life is/was out there, do we currently have the technology to contact it/discover it from afar? Campante is among 41 authors of the study in The Astrophysical Journal, "An Ancient Extrasolar System with Five Sub-Earth-Size Planets."